People were astonished to hear that I was going to the Hong Kong Disneyland spa. Why? Weird part number one: I don’t have kids and have no reason to be running around with giant mice and ducks. Weird part number two: Hong Kong Disneyland has a luxury spa?! At any rate, it wasn’t really my choice in the first place. I was sent there on assignment to review the Hong Kong Disneyland spa for a guidebook. The guidebook was only about spas and nothing else. When people hear what I do for a living, they usually say they wish they had my job. But this was one of those times when spa writing is strangely not as glamourous as people may think. I was given plane tickets, a destination, and 24 hours to get from Thailand to Hong Kong Disneyland, (which is not even in Hong Kong but a long taxi ride away in Lantau Island), check in, get a spa treatment and check out the next morning to catch an early flight back to Bangkok. I’m like an international assassin. Fly in. Do the job. Focus. Get out. Fast. Next! (From what I’ve heard, this also describes the life of an international management consultant). All I saw was the inside of a taxi and the inside of the Disneyland Hotel. I didn’t even get to see Sleeping Beauty’s Castle, other than driving past from a distance. Not that I am complaining or anything. NoNoNoNo! Nottattall (I’m completely grateful for my very nice job!) I’ve heard many people say they would kill to have a job reviewing luxury spas. (“Much better than reviewing, say, prisons”, says my friend Philip). Disneyland wasn’t a place I expected to find a fancy spa, though it makes sense when you think of all the parents who need recovery time after scurrying around all day chasing their kids while oversized cartoon characters come at them from all directions. Sometimes the kids are running after the cartoon characters. Sometimes the cartoon characters are running after the kids. Sometimes you can’t tell which is which because all the little kids are running around dressed up as Disney characters after raiding the gift shop that sells adorable little Snow White, Cinderella, Minnie Mouse and every other costume. And all the parents are chasing after everyone all the time. Am I dreaming? No.They’re all real. The Disneyland Hotel is great fun. I say this, and I am a full grown adult. It’s designed like the biggest Victorian palace you can possibly imagine and is built in a U-shape encircling a landscaped garden and maze facings the sea. It’s quite a fantastic view. The Victorian theme runs rampant all over the hotel, with big overstuffed furniture, curlicued doorways and dangling chandeliers a-plenty. The hotel’s Victorian theme means that the interiors are appointed in new but grannyish décor a la chintz wallpaper, dreamy English landscape paintings in curly gold frames, floral sofas and patterned marble floors. The quaintly named Victorian Spa at the Disneyland Hotel offered some the most sophisticated luxury spa treatments you could imagine. The comprehensive spa menu included Hot Stone Massage and slimming and detox treatments such as an intriguing Fennel Cleansing Cellulite and Colon Therapy, using a fennel and birch body mask on the hips and thighs plus abdominal massage and reflexology to cleanse and detox the colon (from the outside, not from inside, I assume). Victorian Spa massage for mum and dad. Aaaaaahhhh. There was a Nurturing Massage for expectant mothers, using massages techniques adapted to each stage of pregnancy. Weary dads could choose from a comprehensive Men’s Spa Menu with macho treatments like sports massage and deep tissue massage, a barbering room offering beard and moustache trim and even a traditional Victorian shave. A beauty salon offered extensive hair and grooming services for women, including waxing services including the exotic Brazilian bikini wax and the mysterious Hollywood Wax. I still don’t know what a Hollywood Wax is, didn’t have it, and haven’t come across it again in other spas. There was even a selection of makeup services, offering a makeup lesson, bridal make up, and evening and day make up. The kiddies were taken care of with a Children’s Fun selection with face painting, finger painting, toe nail painting and hair braiding to keep the youngsters busy while mum and dad were getting pampered in peace. Special spa packages included luxurious treatments including purifying facials to exotic Frangipani body wraps and 3-hour long rituals involving soothing soaks in Victorian style porcelain bathtubs. Other facilities include palatial indoor and outdoor swimming pools, tennis courts, gym, sauna, Jacuzzi, steam room, and relaxation areas. Let’s not forget that one of the most important icons in any Disney story is a Princess. Litlle girls love princesses. For little princess wannabes, there’s a special pink, pink, pink room called the Bibbidi Bobbidi Boutique! Did I mention that it’s pink? The Bibbidi Bobbidi Boutique is swathed all in pink and is a little girl’s fantasy salon where they can dress up as their favourite Disney princess including Ella. Anna. Ariel, Snow White, Belle, Cinderella, and Rapunzel, with costumes, accessories, hair and makeup artists, and photography. This is for little girls age 3 – 12, when they’re still young enough to like reading fairy tales. (Then come the rebel teen years and after that the second Princess stage when they start planning their weddings and become Bridezillas). For little boys, I don’t know what the equivalent fantasy activity was. Little boys seem to like chunky clunky objects with wheels, mechanical gizmos, things that go Zoooom, and things that go Boooom. Maybe that was happening somewhere else. Like, outside. We stayed on the Kingdom Club Floor, which has its own club lounge serving complimentary breakfast and afternoon tea. Our Kingdom Club Suite had a spacious and very comfortable living room with a huge soft sofa facing a huge TV (showing everything Disney), and a bedroom with two double beds big enough to fit a couple of parents and several small kids in each bed. Kingdom Club Suite living and TV room. The TV is tastefully hidden in the cabinet. Kingdom Club Suite bedroom with two double beds. Notice that the beds are facing another TV, for your Disney viewing pleasure. From our suite, we looked directly into the garden and its beautiful sea view. I was fascinated by the maze and was eager to go down and try it. When we got down there, it turned out to be not what we expected. When we reached the maze we realized it only reached our waists and must have been made for very little children. No adult would ever lose their way in here, which is a good thing, since they wouldn’t want to lose their children in here either. 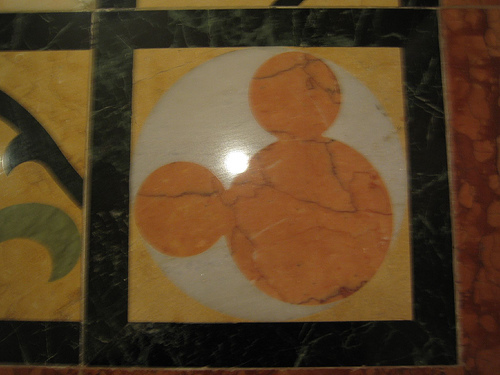 Mickey Mouse is in the center of the maze. While the Kingdom Club Floor had a club room with free deli counter offering a buffet of light snacks all day long, the hotel includes a number of restaurants that offer excellent food and dining fun for the whole family. 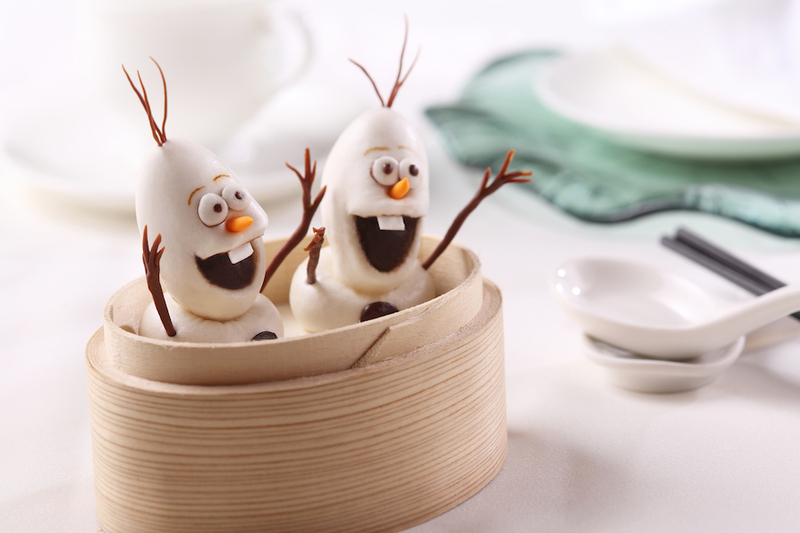 Dining fun means cute food, like Mickey Mouse pancakes and adorable little dim sum cartoon characters. We didn’t have time to eat this cute dim sum since it had to be ordered in advance at the Crystal Lotus Chinese Restaurant; though we had a delicious Chinese dinner there. In the Enchanted Garden Restaurant, you’ll find giant Disney characters frolicking around the tables at mealtime. It’s cute! Kids love it! Even though I never even left the hotel, I can easily say I was as well entertained inside the hotel as I probably would have been outside. Even just browsing through the boutiques overflowing with Disney merchandise and watching the little kiddies running around wearing their little (brand new) Snow White and Cinderella costumes was amusing and interesting. It was so cute! After all, everyone can use a little bit of enchantment in their lives, right? It makes you smile. Have you been to Hong Kong Disneyland? Tell me what you did there! I’d love to hear your experiences.